The official record of the Minneapolis park board, the published “proceedings,” often don’t tell the whole story. 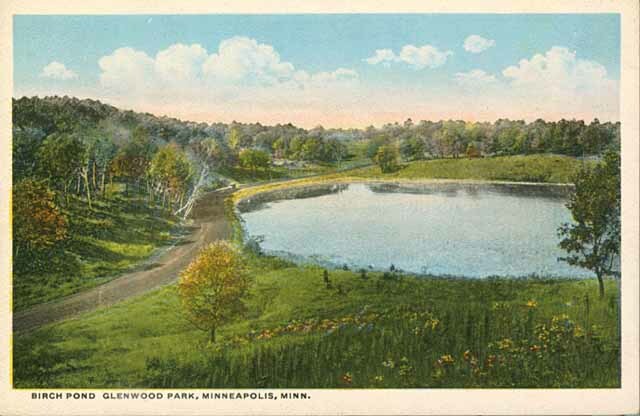 Example: the proceedings of the park board meeting of June 6, 1910 record that the board voted that the “small lake in Glenwood Park between Western Avenue and Superior Avenue” be named “Birch Pond.” That’s been the name ever since. What the official proceedings didn’t tell us I learned by accident while researching another issue. The June 7, 1910 Minneapolis Tribune noted the previous name of Birch Pond — the vastly more intriguing “Devil’s Glen.” I wonder how the little lake got that name. Probably a good story. But I imagine it was more offensive to some people than a lake named for John C. Calhoun. The pond was renamed as the parkway beside it was being built by a crew of forty railroad workers imported from Hungary. The previous year, scheduled construction at North Commons and East River Parkway was postponed due to a labor shortage in Minneapolis. The park board took no chance with its new parkway through what was then Glenwood Park, now Theodore Wirth Park, and imported the workers to build it. 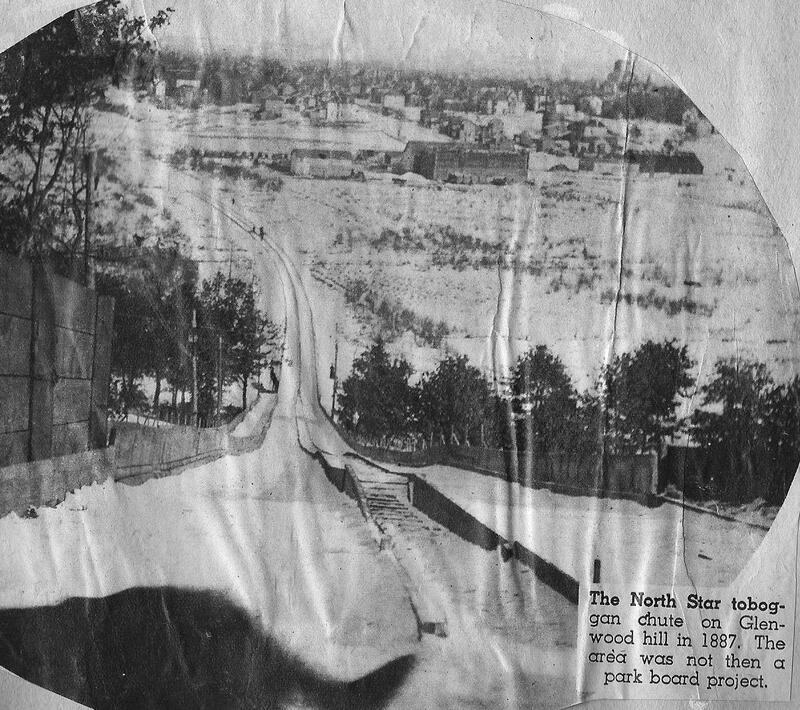 Since posting a newspaper photo of a toboggan slide on “Glenwood Hill” in 1887, I found this photo in the Minnesota Historical Society Visual Resources Database. This photo is purportedly of the same toboggan chute on the same hill in the same year, but they are obviously different places. The photo clipped from a newspaper had trees right up to the sides of the track. Looking up the hill instead of down, gives a completely different prespective on the possible location of the slide. I doubt that the slide in this photo is in the same location as the ski jumps that were built after the park board acquired land in the vicinity. Any guesses as to the location of this toboggan slide? Or the other one? Which one is the real “North Star” chute? 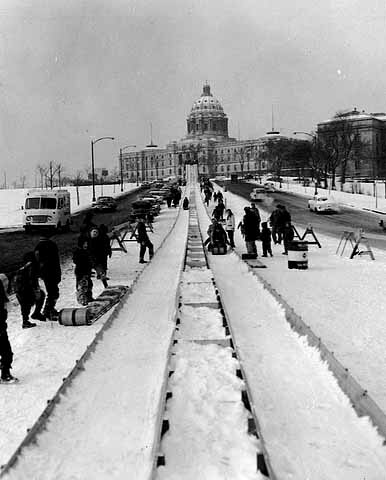 In the same wonderful photo collection, I found this picture of the St. Paul toboggan slide in front of the State Capitol, which I referred to in my earlier post. It’s an old, wrinkled photo clipped from an unidentified newspaper, but it’s also the oldest photo I’ve seen of a toboggan slide in Minneapolis. 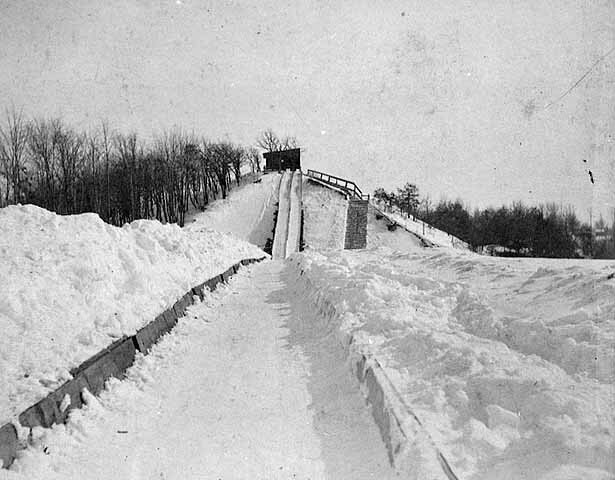 A privately run toboggan slide on “Glenwood” hill in 1887, years before the park board acquired land in the area. The newspaper caption calls it the “North Star” chute and puts the date at 1887. That was two years before the first land (64 acres) was acquired for what was then Saratoga Park. The park was renamed Glenwood Park in 1890 and was renamed for Theodore Wirth in 1938. The majority of the land for the park we know today was acquired in 1909. I suspect that this hill was a part of that acquisition. Although I’m not certain, I think this slide was located near where the ski jumps were later built. At different times the park board operated toboggan slides at Lake Harriet, Lake Calhoun, Glenwood (Wirth) Park, Columbia Park and Minnehaha Park. I don’t believe any of them were operated after the 1940s, but as always its difficult to discern from park board records when such services or programs were stopped. The only toboggan slide I remember from growing up in the Twin Cities was the long slide erected on the approach to the State Capitol in St. Paul. I remember it being operated as a part of the St. Paul Winter Carnival. It was one of the highlights of winter life as a boy in St. Paul. Minneapolis truly is a “City of Parks” for everyone — north, south, east , and west. As a ten-year-old tomboy in north Minneapolis, the neighbor kids and I would hike three miles to Glenwood Park, where we hunted for golf balls at the golf course, climbed the ski jump, and went wading in the creek until the golf workers would yell at us, “Hey, you little brats, get the heck out of that ‘crick’ NOW!” We would find a shady spot and dry off, giggling while eating our peanut butter and jelly sandwiches. 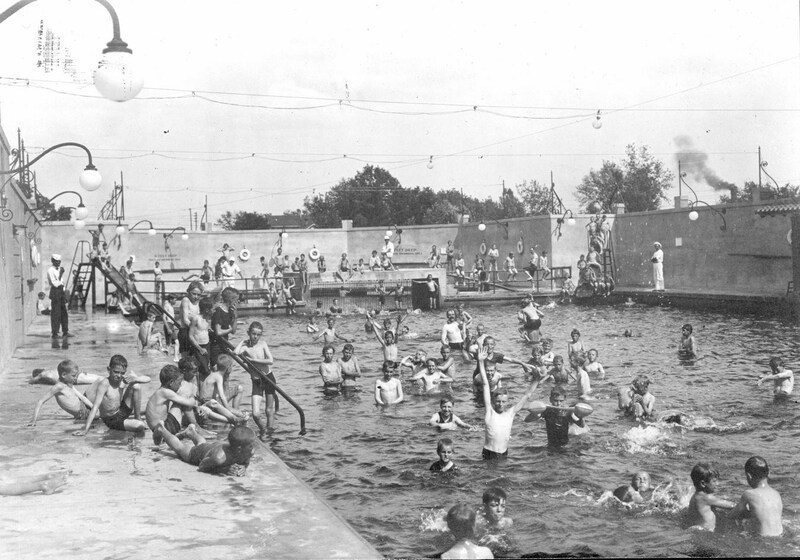 Or we would hike along Victory Memorial Drive to the Camden Pool, where every kid in north Minneapolis came to swim or get a bath. It was jam-packed with grubby young bodies all day long! When I was twelve, we moved to south Minneapolis, the Nokomis Lake and Lake Hiawatha area, another neat area for having fun in the parks. After marriage and four kids, it was my kids who kept up the “fun in the parks” tradition, especially at Minnehaha Park. They investigated every nook and cranny, often ending up at the Falls, where they would crawl down the steep banks to the bottom of the Falls and work their way behind the water falls so nobody could see them and then make scary sounds and howls when little kids came to look at the water falling. Down the path from the Falls to the river was a large tree on a high bank. My son found a sturdy branch to which he tied a long, 2″-wide rope. Then he crawled to the top of the bank, holding the rope firmly an gave a bloodcurdling “Tarzan” yell, swinging form the top of the bank to a small island in the river where he landed. All the kids had a good time with the “Tarzan tree.” There weren’t so many park police or restrictions to keep kids from getting into mischief in the 30s to 60s, but I don’t recall any accidents occurring. Thanks to Theodore Wirth and the Minneapolis Park Board for their foresight and wonderful planning of our great park system. There is so much for our enjoyment, and it’s free.